Council Meeting Films by Clevedon News. In 1996, following another review of Local Government, the County of Avon was abolished (both the council and the county boundary). At the same time Woodspring District Council ceased to exist and Clevedon is now within the administrative area of North Somerset Council, who have registered their intention to devolve some powers back to local Town / Parish Councils who express a wish to take these over. 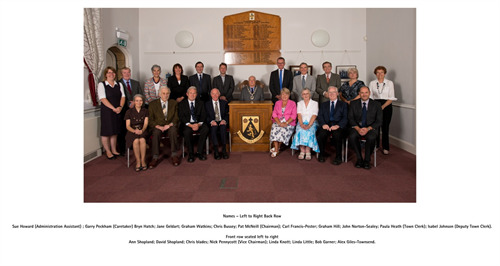 The town is divided into 5 wards and, every 4 years, each ward elects 4 Town Councillors for East, West, Yeo & South 5 Town Councillors for Walton Ward, thereby electing 21 Councillors to represent the electorate. The Council meetings are held monthly and the first 20 minutes of the meeeting is set aside for public participation, prior to the commencement of formal business; during this time any registered electors of the town may address Councillors on any matter other than statutory planninng applications which are dealt with in the Planning Committee. The Council appoints Committees to discharge or make recommendations on any of its functions. Committee meetings are also open to the public. There is an answering service after 2pm. Posted on the noticeboard outside of the Village Hall are; a list of names and address of Councillors, dates of Council & Committee meetings, agendas for those meetings and various posters with community information and the Town Council Website which will help keep information up to date and eay to access. The Council aslo has a Facebook & Twitter accounts see the links on the home page.